Hey guys! The webcomic that I’m going to be reviewing this week is visually stupendous in every way. 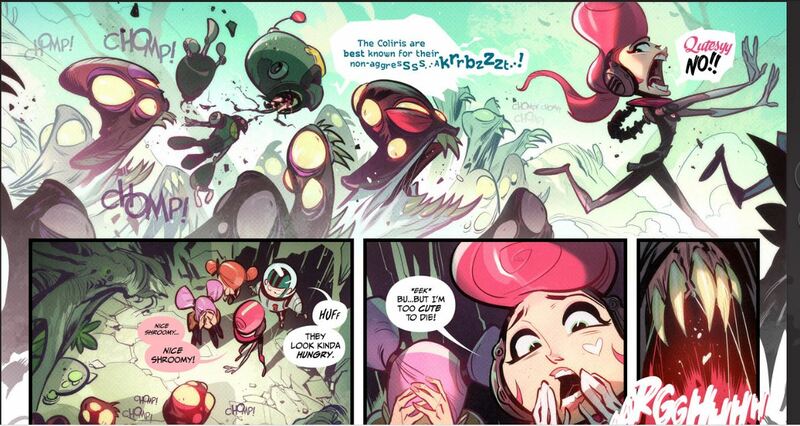 It’s called Impossible Jack by the legendary CreatureBox team! 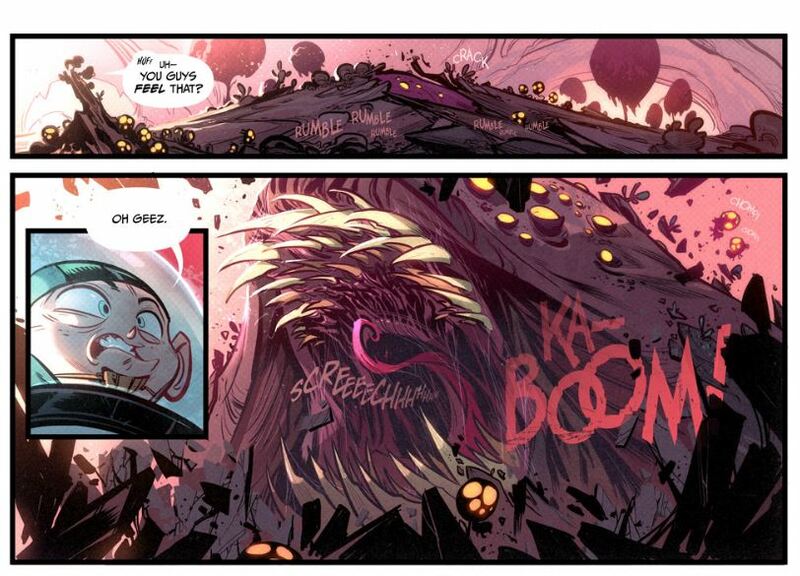 CreatureBox consists of two self-described monster wrangling artists who go by the name of Dave Guertin and Greg Baldwin. They’ve been doing this for a while now, having worked with Insomniac games since 2000 helping craft the now classic Ratchet and Clank games. Things have not slowed down for them in the least with current projects. 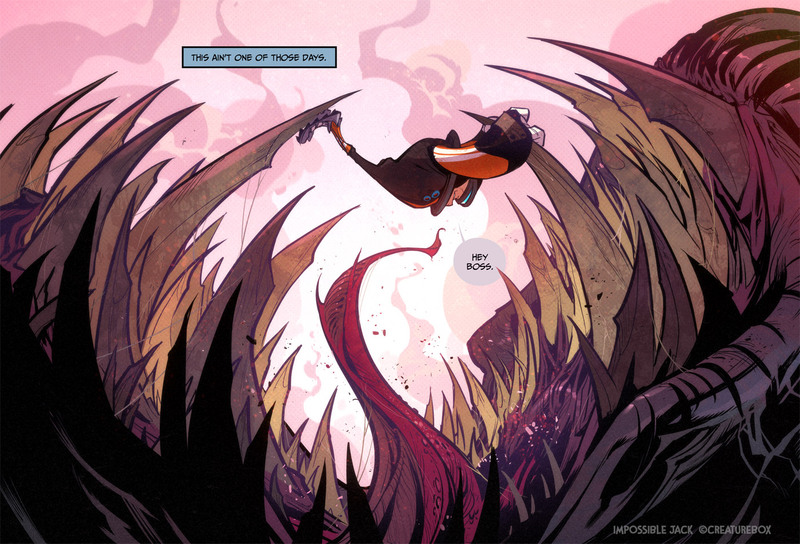 Impossible Jack is a webcomic that has been stalled for some time now (July 27th, 2014), but the sheer majesty of its limited run gives me reason enough to want to share this sequential spectacle. The story follows the exploits of Impossible Jack as he ventures to save some school children who find themselves being attacked by monstrous mushroom creatures one of the children refer to as “Shroomies”. The rescue mission seems to be going as planned for our intergalactic hero until a sudden turn of events elevates the danger-dial up a couple hundred notches. In the beginning of the story we see our heroes in the middle of this tentative entanglement, before they flashback to how they got into the mess to begin with. The character design is out of this world (pardon the pun), with so many characters having their own rhythm and feel. It’s not always the case that the inking and the coloring match the stunning optically-orgasmic illustrations, but this is it! One can’t help but stop at a page just fawning over the energy and detail put into this comic. The lettering is fabulous as well. There’s literally no let up in quality for this webcomic. It sets a bar for webcomics that we’re seeing more and more of today. It’s unfortunate that there have not been any more pages for the Impossible Jack comic strips. I sometimes wonder what they had planned for the story. I would have loved to have known where were they going with it. Hopefully, they can explore this world again one day and treat us to the fantastical universe of monsters and aliens once more!